Before we'd recovered from our nightbus across Macedonia, Ivo whisked us away to his aunt's lovely apartment in a leafy neighborhood, then to his favorite restaurant, Don Tomato. All Bulgarian food contains cheese, and cheese comes in two types: cheese (a dense sort of feta), or yellow cheese. We ate salad with cheese and french fries with cheese and cheese pizza with corn, plus a large beer each, and felt human again. We spent the day strolling the city. Sofia turns out to be a beautiful town of parks and elegant churches and statues of Bulgarian writers and revolutionaries. Next morning for breakfast we had banitsas, crispy folded crepes filled with cheese, and while we munched them a man in swim trunks and a cowboy hat ordered a donut. When he didn't get the napkin he expected, he casually told the proprietor, "I'm going to hook this place to my car and drag it to the Romanian embassy." Later that morning we rented a car and drove south towards Rila Mountain. I had been feeling less and less well since I got off the bus, and by now I had a nasty cold. When we arrived at the base of the mountain, I started to climb the steep path with Ambika and Ivo, but I was wheezing and snuffling too much to enjoy it, so I turned back and took the ski-lift. I waited at the mountain-top hut (it had wifi! ), enjoying the view until the real hikers puffed into view a few hours later. The mountains were gorgeous, and on a much grander scale than I'd expected, but I was feeling terrible, so I stayed in the hut next day while Ivo and Ambika sallied forth for more. They had such a nice hike that they decided not to come back, and somehow managed to email me that they would be hiking over the mountain and would I please pick them up with the car at the Rilski Monastery that evening? Grumbling a little, I took the lift down, drove around in circles for two hours asking directions in my very shaky Bulgarian ("Dobraden! Monastir?") until at the end of a twisty mountain road I miraculously found the damned place. And in a strong hint at the existence of God, the monastery served donuts. I waited in the shade of the old stone walls, worked on my laptop and was a popular subject of photographs by Taiwanese tourists until Ivo and Ambika showed up, flushed with triumph and ready for donuts. * note from Ambika: That hike was amazing! We made it to the remote Ivan Vazov hut in a beautiful, flower filled mountain valley. From there, we hiked on the ridges of cloudy mountains, rounded a bend and saw sheep and horses grazing, and a Bulgarian family tending them while eating cucumbers and cheese, and then passed down through grassland and pine forest til we reached the monastery. That night we drove to the house that Ivo's great-great grandfather built in a village called Stambolovo. It's a small town, full of stork nests on top of each lamp post. Ivo's grandmother, Baba Rumi, lives there alone, but she had broken her arm, so Ivo’s other grandmother, Baba Ivanka came down from Plevin to take care of her and the extensive garden. The two babas welcomed us with kisses and guvech, a very delicious casserole of vegetables from the garden. 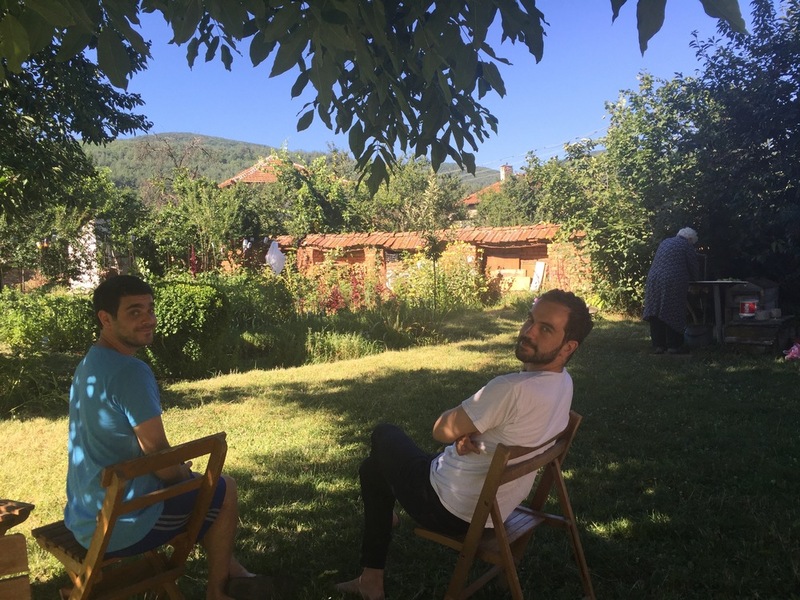 We spent most of the next day lounging in the garden, playing with the neighbor's kitten, eating plums and cherries from the trees and trying to help the babas as they puttered around watering and weeding. 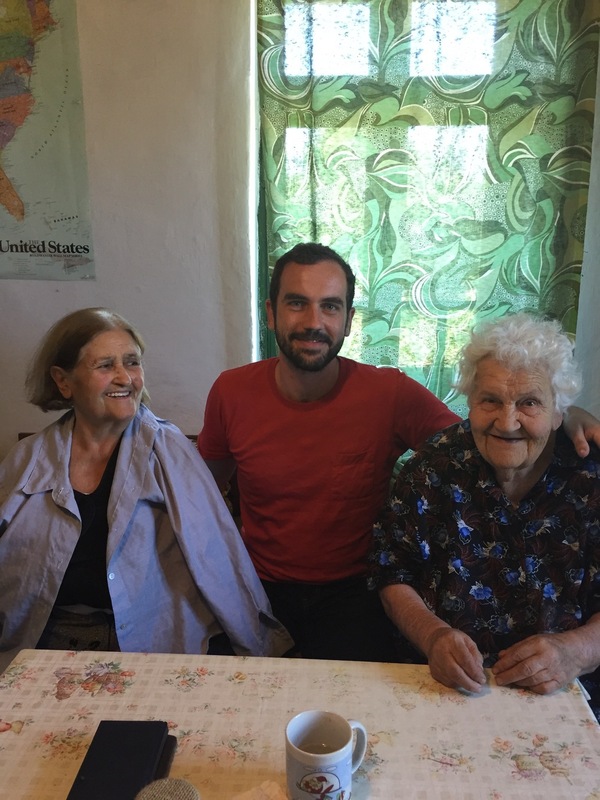 They refused the help, but they smiled a lot and told us long colorful stories in Bulgarian. Ivo translated like a champ, but the babas were too chatty to keep up with. We gathered that Baba Ivanka had befriended a mailman on a visit to Texas, that Baba Rumi knew a lot about pickling vegetables, and that both babas adored Indira Gandhi, but we never knew why. That night they served us runner beans with cheese, zucchini roasted in yogurt and a cold soup of thin yogurt, cucumber and dill called tarator, which was just the thing for a summer night. Next morning we returned reluctantly to Sofia. Ivo had to do his farewell tour of friends and relatives before returning to New York, so I spent the day catching up on work at the apartment while Ambika toured the sights, most of which are named after Ivan Vasov, the "Wordsworth of Bulgaria." We all met up in the evening for a cool-kids night on the town, including dinner at a nouveau-Bulgarian joint (excellent pork, excellent cheese) and beers in a park where the hip youth skateboarded and drank on the statuary. Ivo's friend Bobby derisively calls this set the "zippers," a name that hasn't caught on, but we compared them favorably to the crowd in Tompkins Square and enjoyed their puppies very much.